– Play with others you don’t normally play with! 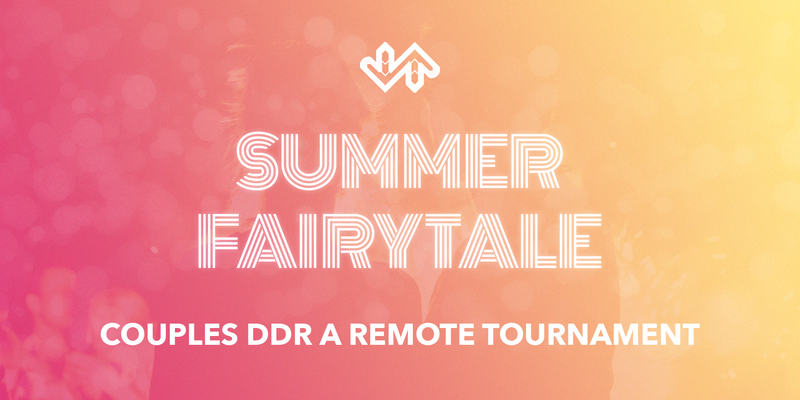 This is a couples tournament — meaning you and a teammate will be competing against other pairs of DDR players! You and your teammate must physically play your sets together as P1 and P2, and provide photos of your scores on the designated tournament songs for entry. Participants will do their best on a selection of songs between July 1, 2018 and August 10, 2018. This is a remote tournament, meaning you will play as much as you want, at any time throughout the tournament dates on your local DDR A machine. To participate, you may enter either the upper division or the lower division. However, you may enter as many times as you’d like with different teammates to form unique teams. Lower division will have songs with difficulties from 9 to 13. Upper division will have songs with difficulties up to 18. You may also enter the mixed division. Mixed division teams must include at least one woman-identifying competitor. This may be entered in addition to either upper division or lower division, or you and your teammate may choose to exclusively compete in the mixed division. This may also be entered as many times as you’d like with different teammates forming unique teams. Mixed division will have songs with difficulties up to 17. There will be a total of six songs for each division, divided into two specific sets of three songs each. The songs as must be done in a complete set as outlined, but you may play them in any order desired. Extra stage may be used to replay one of the songs in the set to improve it. Each song will have a set difficulty to play on, and may require you and your teammate to play the same song on different difficulties. If the song has different difficulties listed, you and your teammate will individually determine on a song by song basis who will play which difficulty. We recommend discussing before you play where your and your teammates strengths lie! Try to talk through in advance who will play which difficulty. You may also choose to change who plays which difficulty for later sets. Even if you have previously submitted scores, you can replay the set and change who plays on which difficulty. Try it out in different ways! You must play on an official DDR A machine. No Stepmania scores will be accepted. Any modifiers may be used with the exception of Cut/Little. You are encouraged to submit improvements as often as you play. For score submissions, please include photos of each song’s results screen AND a photo of the summary screen, showing overall set results (a total of four pictures are needed per set). Make sure to discuss with your teammate who will be responsible for submitting scores, and decide on a team name together! Photos must clearly show your e-amuse DDR tag, your teammates DDR tag, and EX score for both players. Points will be awarded per set on a scaled basis, using total combined EX score. Division winners will be determined by total division points earned at conclusion of the tournament. If teams are tied by amount of points, the tied teams total combined EX score across both sets will be used as a tiebreaker. Although you may enter with as many unique teams as you like, each individual may only place ONCE, and this impacts the entire team. There will be additional opportunities to earn points by completing tournament challenges with your team. You must play within your appropriate division. As a rule of thumb, if you are capable of consistently passing 14s and have passed a few 15s, you should enter the upper division. This is a friendly competition, but we still want competition to be fair. Use this tournament as an opportunity to meet new people, play with others you don’t normally play with, and to push yourself to get the best scores you can! Harassment or bullying of other participants will result in disqualification. This is at the discretion of tournament organizers. Scores must be from the time period of the tournament and must be submitted on time.